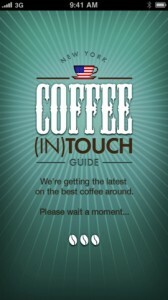 New York: Coffee Guide is an iPhone app developed by (In)Touch Network, Ltd. This free app is a helpful tool for when you’re in New York City and need to find a place where you can get a cup of joe. But not just any cuppa will do. 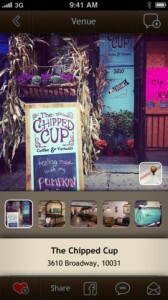 New York: Coffee Guide only features New York’s best independent coffee shops, coffee houses and cafes. Each shop on the map is hand-picked by a panel of coffee experts, and all shops serve locally roasted, premium-quality speciality coffees. Using your current location as a jumping off point, you can see all the cafes that are currently near you. 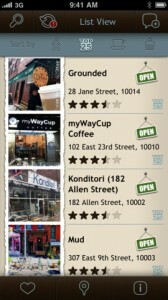 Even more handy: the app shows only cafes that are open at the current time. Want to find a particular shop? You can search by name, borough, ZIP code, or even subway stops! This is a gorgeous looking app with a great design. I loved how detailed each shop profile is. Beyond just the basic contact info, you’ll also get WiFi avaliability, ratings, and a great little snippet about the shop with tips about what to try written up by an expert. Honestly, my only complaint is that there isn’t an app that covers all of the United States. It would be an amazing app for road trips, or to just help you find cool coffee shops in your hometown that you might have overlooked. New York: Coffee Guide rules, but it also makes me sad that there isn’t a similar service for my stomping grounds. Whether you live, work, or just plan to visit New York City, this is a must-have for conscientious coffee drinkers. In addition to be supremely useful, it’s also a lovely-looking app. 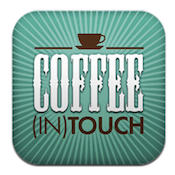 Oh, and if you’re traveling to the UK (In) Touch Network has a similar app for finding a good cuppa in London. 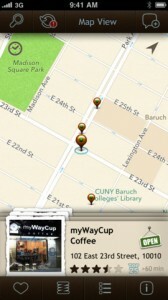 New York: Coffee Guideis compatible with iPhone 3GS, iPhone 4, iPhone 4S, iPhone 5, iPod touch (3rd generation), iPod touch (4th generation), iPod touch (5th generation) and iPad. Requires iOS 5.0 or later. This app is optimized for iPhone 5.